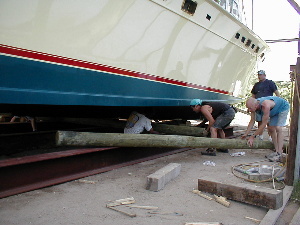 July 1, 2003 We’re speechless with excitment as we enter Day Two of the launching process, so we’ll get right to the pictures. 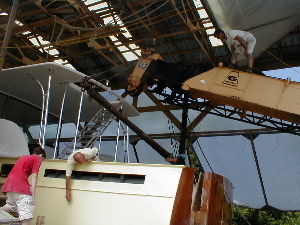 Below is a series showing George Brown placing the I-beams in position with his crane, lowering the lift strap for Cherokee, placing the rollers under the vessel, and lowering her on to the rollers. 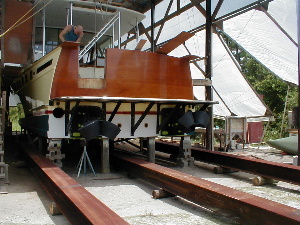 Isn’t it funny how this very modernized Huckins is going to be pushed to the water in the old fashioned primitive way of beams and log rollers? 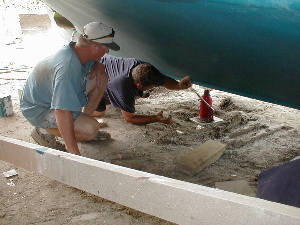 It was important to get the weight of Cherokee just right on the rollers, so no roller would take on too much weight. “If you hear a big crack when I set her down, that’s bad!” smiled George, explaining that a poorly weighted vessel could result in it cracking in two. 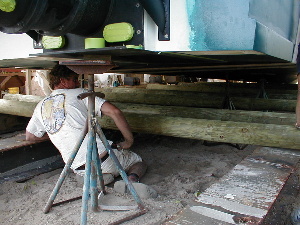 To help distribute the weight, the crew jacked up the bow and shifted rollers in this strange science of boat moving. 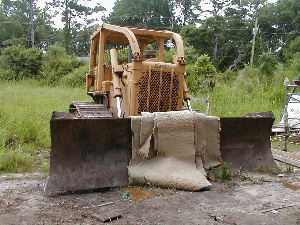 Jerry Davis picked out some choice carpet pieces for his bulldozer, and moved it up to Cherokee’s bow. 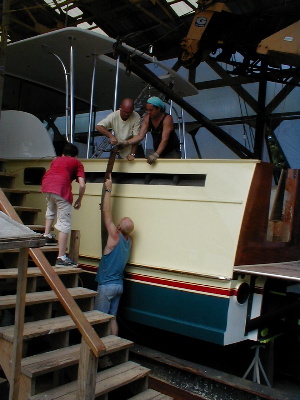 As the crew held its collective breath, Jerry pushed the vessel out a few feet just to see if she’d roll properly. Of course she rolled like a queen on skates! 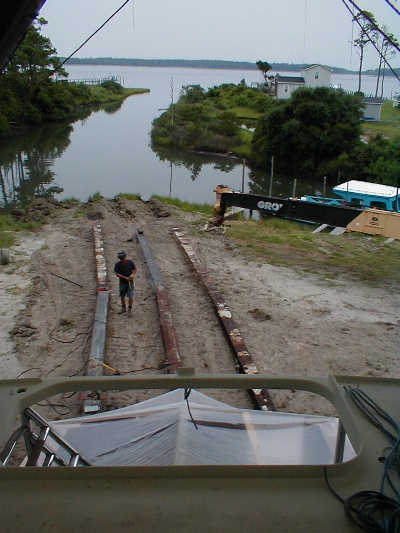 Today (July 2) George and Julian Brown will finish welding the I-beam track together, and tomorrow (Bryan’s birthday!) 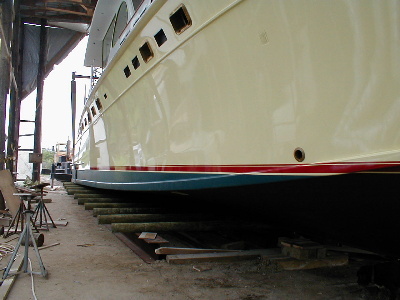 Cherokee should meet the water again at last! 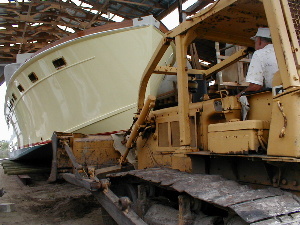 Does this mean the project is over? Hardly. 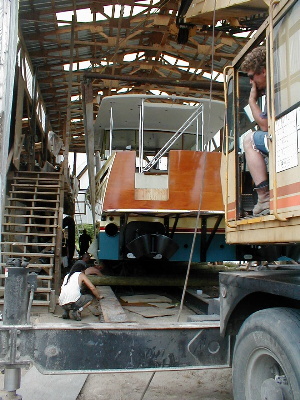 More work will be done on the interior, but by launching the boat now, the crew can test the engines and work out any bugs in the electronic system.